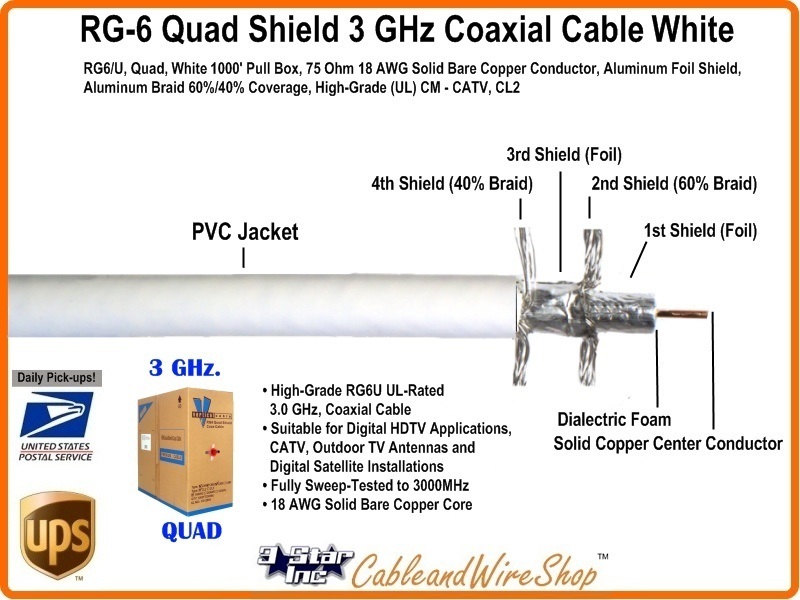 The Best Cable to use for Satellite TV and Cable TV, RG6/U, Quad, White 1000' Pull Box, 75 Ohm 18 AWG Solid Bare Copper Conductor, Aluminum Foil Shield, Aluminum Braid 60%/40% Coverage, High-Grade (UL) CM - CATV, CL2. High-Grade RG6 UL-Rated Coaxial Cable Suitable for Digital HDTV Applications, CATV, Outdoor TV Antennas and Digital Satellite Installations. Note: SuperShield (Quad Shield) - Taking the Tri-Shield construction one step further, this construction adds an additional layer of shielding braid to provide the greatest strength, durability and immunity from network interference. Provides low attenuation for service drop inteconnecting jumper cables.